As I sit here in the Airstream, writing, a thunderstorm is approaching. I’ve been working at the dinette quietly (so as not to disturb my sleeping fellow travelers) since 8:30, while watching other campers pack up and flee ahead of the approaching storm. 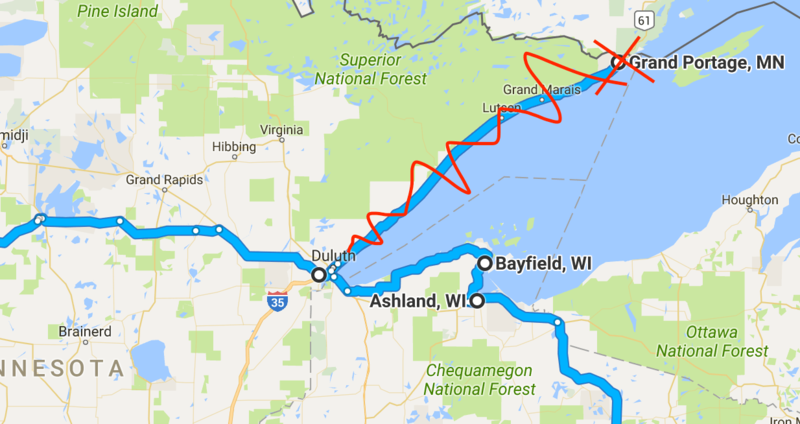 Our plan had been to travel up to Bayfield WI, which sits on a large peninsula in southern Lake Superior and which is an excellent starting point for exploring the Apostle Islands National Lakeshore. Then we were going to head further around the lake and north to the remote Grand Portage National Monument. During that visit we planned to take a ferry to Isle Royale National Park. Isle Royale has the distinction of being the least-visited National Park, because it’s hard and expensive to visit, and it was sort of a “bucket list” spot for me. This is despite some disdainful online reviews of Isle Royale as a gray, forbidding, and unfriendly place. Any island in the north has the possibility of being grim on a bad weather day, just as they can be delightful on a sunny summer day. It’s that wide range of moods that seems to attract some people. We were prepared to deal with Isle Royale regardless of weather (up to a point; I’m not getting on a boat for hours if the lake is heaving like a roller coaster). It’s an experience no matter what, and we collect experiences. A singularly uniform collection of perfect weather would be boring. But neither Isle Royale nor Zik’s Bar will work out for us now. There is only one campground within 30 miles of Grand Portage (offered by the Indian casino that seems to be the source of most civilized amenities in that area) and that place is booked solid. 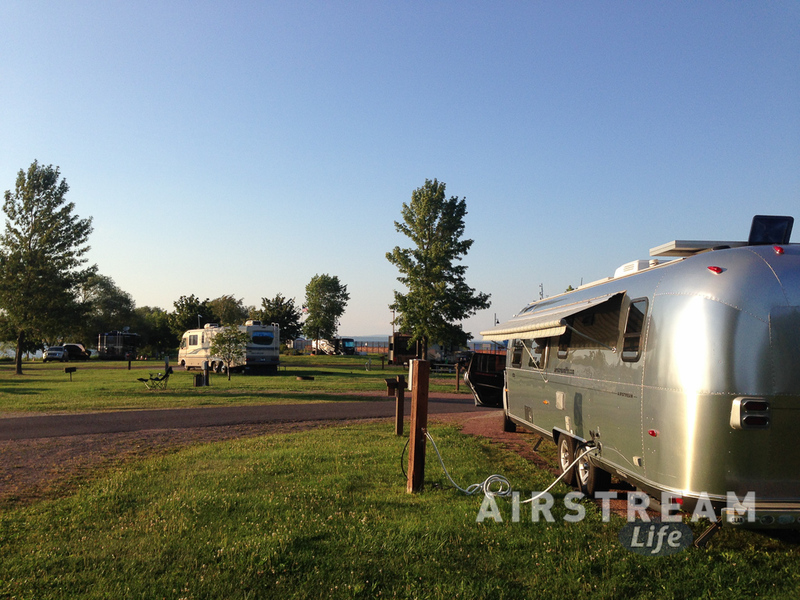 No other RV camping exists in the small town of Grand Portage MN, and the outlying national forest sites are all far away and lack cellular service. I hate to admit it but cell service is a serious requirement for me these days. After hunting for alternatives for an hour, we finally decided the best path was to scratch Grand Portage/Isle Royale off our itinerary. This sort of thing rarely happens, but when it does there’s always something else to substitute. We’ll cut 286 miles and about four days off our trip by skipping the Grand Portage side trip. We decided to spend an extra day in the Apostle Islands area and save the other day or two for later out west, when we’ll certainly find something else that makes us want to stay longer than planned. Heck, we’ve already had that happen twice on this trip and we’ve only been out for 9 days. To unsettle our plans a bit further, we finally ran into some weather. We’ve been remarkably lucky so far, with brilliant summer weather all the way from New York to Wisconsin, but now in Ashland WI (our starting point on the shore of Lake Superior) we finally got whacked with thunderstorms this morning and a 100% chance of rain in the Apostle Islands tomorrow. The photo above is from yesterday. Today it is gray and occasionally rainy, so it looks like we will have a subdued visit to Lake Superior. We’ve decided to stay in this cozy waterfront city RV park for another day and get some work done. It’s a nice spot, with a hike/bike trail attached, a cool oceanographic research ship docked nearby, and a huge dock that we can walk out on for an even better view of the lake area. The surrounding town seems pleasant, and there’s really no reason to rush now. In fact, given the weather I might have passed on the Apostle Islands this time and moved further west but I’m trapped by that bane of all full-timers: mail drop. Even in this high-tech payment world, most of my advertisers pay their bills by paper check, and so I’m required to occasionally get a mail drop somewhere or run out of money. Plus I am expecting a few other packages, like copies of the Fall magazine. I’d like to see that. Yesterday morning I told everyone to ship via FedEx and UPS to the campground further north we thought we’d be at by Tuesday evening, so at some point on Thursday I really need to get over there and pick up my mail. We’ll move tomorrow between storms, if possible. In the meantime, it’s a working day and plenty of things to do here at my desk by the shore of Lake Superior. We have been reading your blog on and off for years, My wife and I live by Hudson Wi. just a couple hours south of where you are now. 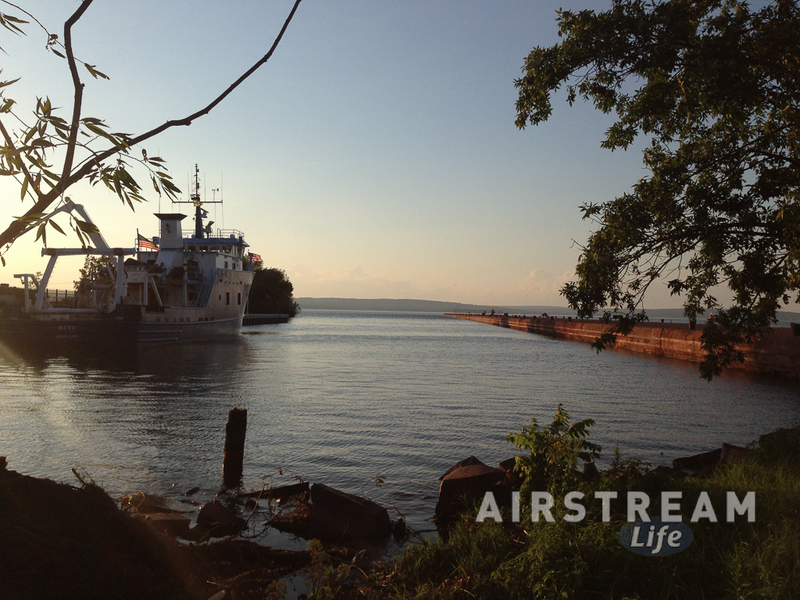 We are heading up to Lake superior at the end of August, wish we were there now to meet you! If you are going to stay in the Duluth area I can give you a recommendation for more camping spots?Amnicon Falls State Park, http://www.lakeheadboatbasin.com We love it up on the lake and try to get there a couple times a year. I have just a few more years at my day job and hopefully we will be joining you on the road! Hope you have safe travels! Thanks for your inspiring righting!